I got my podcast and the archive loaded back out on the web! All the links should update automatically, so you can continue to listen uninterrupted. I am making one change, though: this site (disneyview.blogspot.com) will no longer be updated. I just can't keep this up separate from the podcast itself. Please visit DisneyWorldPodcast.net for the latest incarnation of what I'm doing. Due to a problem with my podcast host, only my last 10 episodes are currently available. The rest will be back soon! ... and the links on this blog probably won't work for a while. Visit http://feeds.feedburner.com/DavesDisneyViewPodcast?format=xml for the full feed as it exists today. By the way, if anyone has any suggestions on good places to host a podcast, let me know! Overview: I was giving some thought to one big reason Disney is successful, and that's "big data" - Disney uses a wealth of information to help you to have a magical time. I explore the concept on this podcast. Notes: On a future show, I'll have to delve into more of how this data is used. 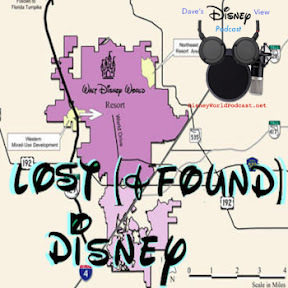 Of course, you can learn more about the history of Disney’s relationship with the state in my video series: lost and found in WDW! Overview: Today’s main theme is the announcements about Star Wars Galaxys Edge. We have dates, and know many of the shthings that will appear in the land. Plus, I’ve got some other news and notes to share. Notes: Galaxy's Edge will either be terrific or it will merit a yawn....hard to say which....but they've invested a lot of time and effort (not to mention money) into the parks to make it happen, and the sheer size is massive. So it certainly has the potential. I can't wait to see it. My pressed pennies app for iOS is now available for free. Hope you enjoy! Overview: I’ve got a couple of personal tales to tell along the way - about a trivia contest I was in, and a friend’s question about a birthday celebration. Then, I talk a little about Dave Smith and his recent passing, and some proposed changes to state legislation that could impact Walt Disney world. Notes: IMHO Dave Smith was a Disney ledgend for the way he preserved history.